Grand Staircase-Escalante National Monument extends over an area of nearly two million acres in southern Utah in the USA. The territory of the Grand Staircase-Escalante National Monument has three main regions - these are Grand Staircase, Kaiparowits Plateau and the canyons of the Escalante. The area was declared a national monument in the United States by President Bill Clinton in 1996. The area of the monument extends from the towns and Glendale and Kanab to cities Escalante and Boulder. In the western part of the monument lies the Paunsaugunt Plateau and the Paria River. Grand Staircase-Escalante National Monument is of important historical and geological significance and is of interest to paleontologists. 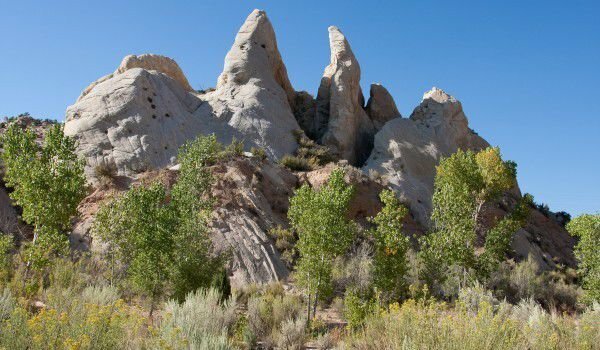 Grand National Monument Grand Staircase-Escalante has a geological formation that has been formed over many years. It is incredibly beautiful and has colorful cliffs, plateaus and canyons. Three regions - Grand Staircase, Kaiparowits Plateau and the canyons of the Escalante are characterized by extremely difficult to overcome terrain. Human foot is rarely set in these places in ancient times. But there was some thrill seekers and adventurers, who were attracted by the beauty of this region. Terraces, which form the Grand Staircase - great pillars shine in different colors of the spectrum ranging from gray through to hot pink and bright orange. These magnificent natural formations here are two hundred million years ago. Bright orange slopes contain large amounts of fish and fossils of early dinosaurs, that lived during the Triassic Period. Orderly series of rocks known as White Cliffs is composed mainly of sand dunes since the Jurassic period, and the sand dunes that have hardened to sandstone of the Navajo. Over the white slopes, tower gray cliffs, presenting far softer options. There are fossils of sea creatures – here are found seashells, shark teeth and other fish and marine animals. On top of the towering Grand Staircase pink limestone rocks that were sculpted by the waters of ancient basins and are now mostly located within the Bryce Canyon National Park. Paria River and its magnificent curves are carved and shaped within isolated valleys and narrow canyons. The highest part of the national monument is Kaiparowits Plateau. High plateau from the air is seen as a huge green-gray triangle, which stretches to Lake Powell and the plateau Paria Plateau. Formed with fossils rocks, the plateau contains incredible collections of ancient animals. Kaiparowits Plateau is full of canyons and streams. The territory of the plateau has magnificent peaks. Kaiparowits Plateau is home to many wild animals and birds , including seventy types of predators. Long forty-two miles Straight cliffs stretch up the mountain Fiftymile. This place is considered one of the most lonely and isolated places in the world. The territory is of the beautiful Escalante River, which has created an amazingly beautiful canyon. The landscape in these dry areas is created by the water.